More PageMaps to Kick-Start Your Creativity! Even the most imaginative people get stumped sometimes. Author and artist Becky Fleck's easy-to-use sketches will help get you over the hurdle with 92 brand new sketches for traditional and digital layouts, greeting cards, mini albums and home decor items. In addition, you'll find new artwork for over 140 incredible layouts and projects in a variety of sizes that will inspire your own artistic creations. 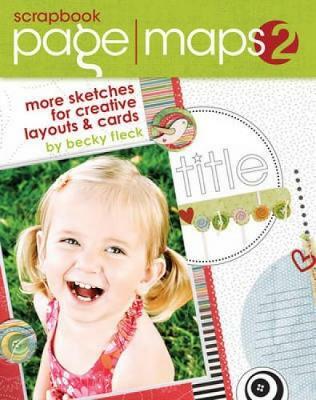 - Discover new layout sketches and artwork from the author of Scrapbook PageMaps, including a full chapter devoted to greeting cards. - Learn to use sketches to focus and coordinate your ideas whenever you're feeling overwhelmed by materials, photos and journaling. - Take your favorite sketches along with you! Included are 64 travel-size sketch cards for easy planning wherever you get inspired. - Learn new techniques and methods with easy to follow step-by-step instructions. - Find "Eye Spy" tips from the author that point out the unique, unusual and unexpected elements you can use to make any page even more special. If you're feeling stumped with how to use that special photo, or if you just can't decide how to use those beautiful supplies, Scrapbook PageMaps 2 will help you tell your story!